Holiday Cocktail Fundraiser December 17th! 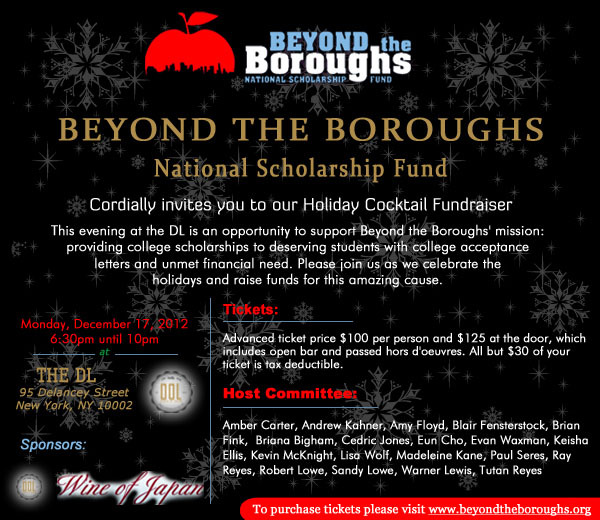 Beyond the Boroughs presents our Holiday Cocktail Fundraiser on Monday, December 17 from 6:30pm-10pm at the DL on 95 Delancey Street in Manhattan. This evening at The DL is an opportunity to support Beyond the Boroughs’ mission: providing college scholarships to deserving students with acceptance letters and unmet financial need. Please join us as we celebrate the holidays and raise funds for this amazing cause!